Teresa Drantino first appears at Painesville, Lake County, Ohio, in 1903. She moved to Painesville from Pennsylvania with her husband and children. 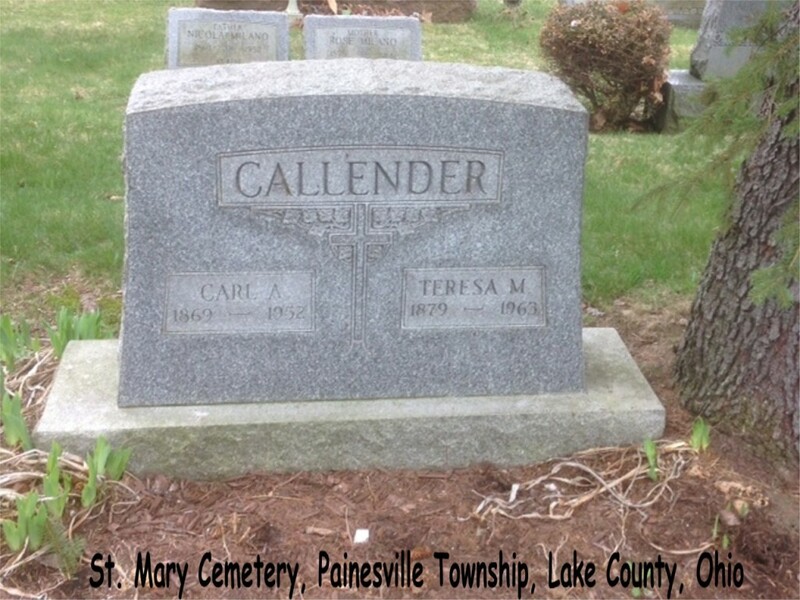 In America Teresa Drantino was known by her married name, Theresa Callender. Teresa Drantino was born on May 21, 1879, at Reggio Calabria, Reggio Calabria Province, Calabria, Italy. She married Carlo Colantuono in 1900, at Pennsylvania. Teresa died on May 14, 1963, at her daughter’s home, Madison, Lake County, Ohio, at age 83. 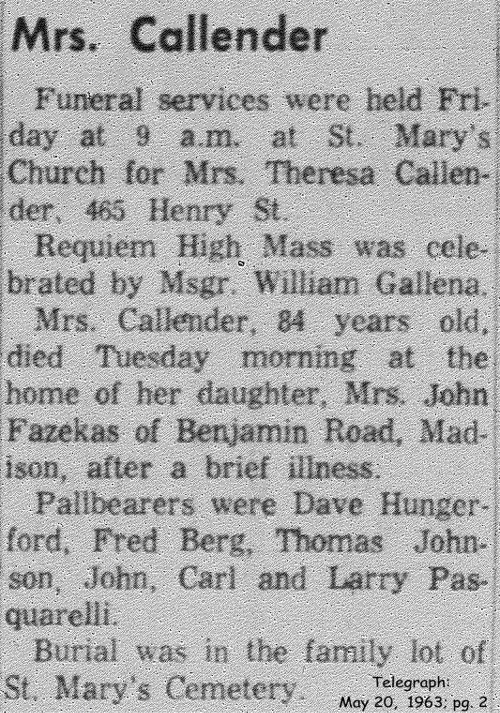 Her body was interred at St. Mary Cemetery at Painesville Township, Lake County, Ohio. Teresa Drantino immigrated to the United States in 1897. Teresa Drantino was enumerated for the 1920 Census of the United States, on January 22, 1920, living at Seventh Street, Fairport Village, Lake County, Ohio, as a wife of Carlo Colantuono. Teresa Drantino was enumerated as Tressie Colamtwone. Teresa Drantino was enumerated for the 1930 Census of the United States, on April 15, 1930, living at 465 Henry Street, Painesville – Ward One, Lake County, Ohio, as a wife of Carlo Colantuono. Teresa Drantino was enumerated as P. Teressa Callendar. Teresa Drantino was enumerated for the 1940 Census of the United States, on April 9, 1940, living at 465 Henry Street, Painesville, Lake County, Ohio, as a wife of Carlo Colantuono. Teresa Drantino was enumerated as Theresa Coluntone. 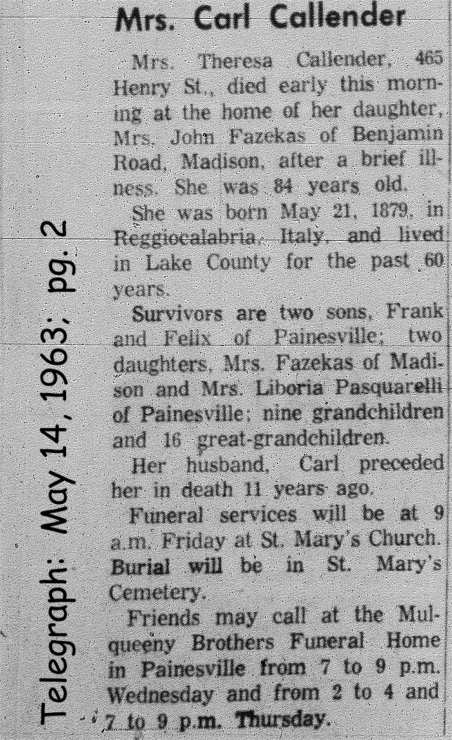 Teresa Drantino was widowed by the death of her husband, Carlo Colantuono, on March 28, 1952, at Painesville, Lake County, Ohio. At the time of death, Teresa resided at 465 Henry Street, Painesville, Lake County, Ohio.